Whether you're growing a small patch of grain, cutting some hay, or just wanting to keep an area mowed without a gasoline engine flapping in your ear, the scythe is a great tool. We managed to get a good one many years ago, and I recommend it enthusiastically it if you can find one similar. We first had one of those heavy, hardware store models -- which was a joke, though not a very funny one if you were trying to do any serious work with it. Then we splurged for a model purchased from Smith and Hawken (this was way back when they sold quality tools, no relation to the current catalog by the company of the same name). Our scythe was made by Hand & Foot Ltd, Green River Rd, PO Box 611, Brattleboro, Vermont 05301. After almost twenty years, it is still in great shape, though much broken in. The snath (the wood part) is straight with movable handles to fit different sized people. This part would be easy to make. The blade is of high quality steel, thinner and lighter than the hardware store monster. It sharpens well to a razor edge. This would not be easy to make, unless you were very, very skilled in blade making. Keep an eye open for a good one, new or used. It will be worth a hundred bad blades. The tool is a real joy to use, even if you aren't that proficient, which I'm not. I've been tempted when I've finished mowing a section with the scythe to take the power lawnmower to it to hide the terrible haircut, especially when it is right next to Steve's neatly mowed patch! But I enjoy it anyway. Learning to use the scythe is more a matter of loosening up and letting the tool do its job, joining its rhythm. Don't worry if you don't quite have the muscles for it when you begin -- they will come! 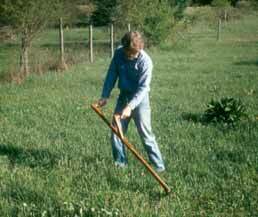 This is a tool for the grasses, not for sapling and brush. But it is very handy, even if you aren't cutting hay or grain. We use it for what might loosely be called "lawn mowing", as well as for mowing mulch hay, cutting down green manure plots in the garden, knocking down various "weedy/light brushy" spots, around the fruit trees, and grain harvesting. It is handy, peaceful, fun. It's a very satisfying tool. Good exercise, too! For years I'd read that you had to keep the area around my garden well mowed to keep the insects and weeds back. And for years I did just that. We had (and have) very little mowed area around our home and "yard" (actually fields between forest), but the area around the garden was well shorn. When we had chickens they enjoyed this mowed area, especially as I was mowing (with a gasoline mower). They would come running when they heard the machine and would scramble all around after the grasshoppers and other insects that were flushed out by the roaring engine. You had to be careful not to mow a chicken a two. But when the hawks and owls came around, the chickens were much safer in the tall growth around the edges. The chickens are gone many years now, and I don't mow as much. The field/lawn often grows tall around the garden and orchard. Sometimes it is cut it for mulch, sometimes left to flower for the pollinators. Now I mow paths and patches -- around the garden, to and from the garden shed, the windmill, the fruit trees, the gate. Wherever we traverse often. We enjoy the paths more than broad mowed areas. I mostly use an electric battery powered mower now, one that can be charged up from our solar electric system. It isn't any faster but it's more pleasant than the gasoline and is my first choice. These mowers have come a long way since our first ones. They are much more practical. However, when growth gets tall it's more than the electric can handle so the old gasoline mower, which has been asked to mow things more than the manufacturer planned I'm sure, comes to the rescue. I use whatever tool makes the most sense to me, and what I enjoy the most. We had many insects and weeds before, and we have many insects and weeds now. No better, no worse. The garden is full of insects in fact, and occasionally a new weed or two. It's interesting, it's fun, and the garden produces more food than we can eat in spite of what I do, or don't do. And besides, I'd rather watch the insects than mow any day. P.S. - For many years after Smith and Hawken changed their direction and dropped those great tools they used to carry we couldn't find a source for these excellent scythes. But this was before the internet opened up the world for those of us in rural areas. It seems that almost anything you want is available somewhere now! Go for a good one, it's well worth it. To comment, ask questions, or just say Hi - click here Contact Us. We enjoy hearing from our online friends and visitors! Enjoy these articles? Feel free to leave a tip! All donations go toward providing live music for non-profit events, activities, and audiences. You can donate to ManyTracks using: . Thank You!! We do appreciate it. * Should you want to use all or part of one of our articles in a non-profit publication, website or blog we simply ask that you give proper credit and link (such as "article by Sue Robishaw/Steve Schmeck from www.ManyTracks.com"), and we'd enjoy knowing where it is used. Thanks! We always appreciate links to our site www.ManyTracks.com from appropriate sites, and we thank you for recommending us! 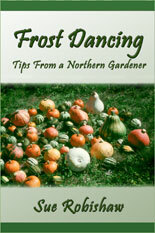 Have you read "Frost Dancing - Tips from a Northern Gardener" ? A fun short read. or "Homesteading Adventures" Creating our backwoods homestead--the first 20 years. and "Growing Berries for Food and Fun" A journey you can use in your own garden.